Whilst it is sad, gut wrenching so, that teams have folded in 2018 and talented riders are lost to the sport, it is also awesome to see through a lot of hard work, teams like Vitus Pro Cycling and Canyon Eisberg both stepping up for 2019. Both of them had to really tough it out during the winter of 2017/18 to be part of the racing in 2018 and for Canyon Eisberg, it was quite a year. VeloUK recently spoke to Tim who was busy with ‘real’ work with the company’s he is responsible for along with the pro team Canyon Eisberg. Those companies include Roadwheel (http://roadwheel.co.uk) for motorcycle and car repairs and another company for housing development so in Tim’s words, he’s got a fair bit going on during the off season catching up. The 2019 season will be Tim’s eighth in the sport as a DS/manager/Team Owner after five with Pedal Heaven, and two so far with Canyon UK. Since he got involved in the sport, he says that whilst there were three or four teams around back then, the level of the racing has gone through the roof. “The racing level has gone up a mile which is why when we go to the big races, we’re competitive and there is more depth here now” Tim explained. Before we looked back at this year, Tim explained that for 2019, despite the lack of money around, he will have a bigger squad for next season, his biggest squad ever and one with an average age of 23.2. The reason for the large squad, he explains, is partly because he didn’t want riders being lost to the sport. “I have taken on riders who found themselves without rides that I didn’t want to see go without, and partly because I am getting a programme together than can almost support a split calendar. The future is bright in that we are making progress but it still feels a challenge but then running any business is a challenge”. 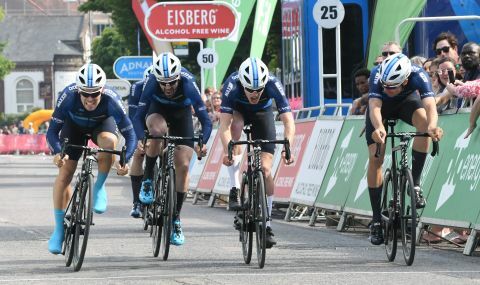 One of the biggest talking points from the last season will be a conti team winning a stage in the Tour of Yorkshire thanks to Harry Tanfield of Canyon Eisberg. It wasn’t long ago Tim’s team could not get a ride at Yorkshire and here they were with Harry winning a stage in the race. 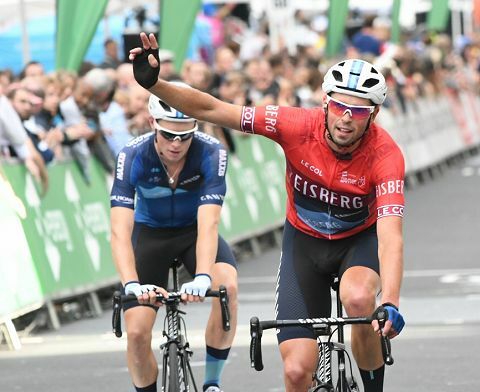 “Overall, this season, I was pleased with how the guys rode at the Tour Series too (which they won) , and then we proved at the Tour of Britain without Harry that we can still get stuck in and get good results. We took the jersey (Sprints) at the end (Alex Paton) but before that I was already satisfied as we had three top tens, Max in the top 20 on GC and so we had proved it was a good race for us even without the likes of Harry and showed we had that depth in the squad”. 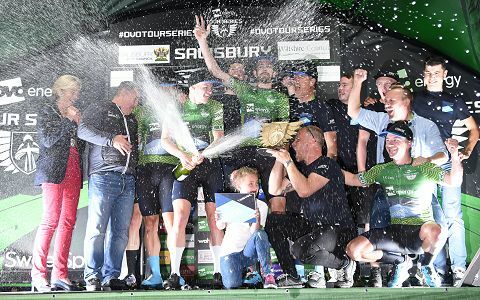 Another 2018 season talking point will be the manner in which Alex Paton in Tim’s team colours won the Sprints jersey in the Tour of Britain on the celebration stage around London. 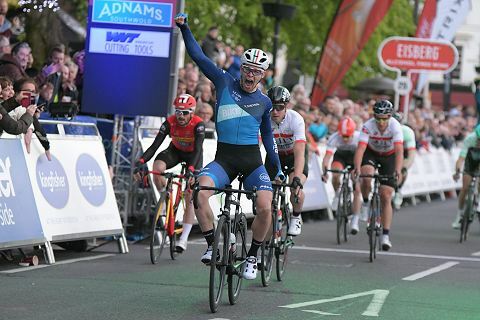 Whilst Alex had probably already won it the day before with his ride then, there was still a challenge coming from a formidable opponent in Matt Holmes (Madison Genesis). “He started well and people never got to see that. 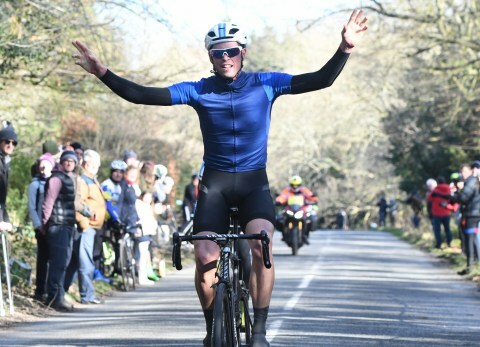 He rode the European races really strongly and was coming on nicely and into form for the CiCLE Classic which was a target race and then he was involved a crash that wasn’t his fault at two thirds distance”. 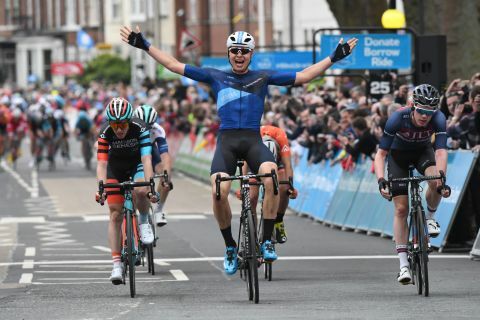 Did the Tour Series victory surprise him? “No. I wanted to win it and I felt we had been competitive last year but we had so many wet races then and had wet issues. In the dry races (2017), we’d won* so I knew we could do it if we got it right. It is not easy because Madison Genesis and JLT are both very good in that racing so it was going to be a battle but one I had been looking forward to for quite a while. I did want to win, and felt we could but you still have to go out there and do it”. Tim though is not a fan of dwelling on his team’s results and would rather look forward and to future victories. “You have to look back and see how you did a good job in a race but I tend to not look back too much” Tim explained. “You have to look at who (riders) brought what to the table, and who helped us get to where we needed to get to though”. “The team of 18 will include three specialists (GB trackies) who will be missing for chunks of the season and also a few young guys” says Tim. It doesn’t feel that long ago that when we spoke about Tim and how he was the new kid on the block like back in the Pedal Heaven days. But now he is signing riders who have won some very big races both here and abroad. It is like he is now an A lister in the sport of cycling in Britain. Does he feel that way himself? “I like signing the good riders I have and am pleased we have got to the point in the sport that these riders want to sign for the team and pleased they will come to my team for less money because they like the way it is run and the calendar we are running. That is satisfying and says that me and the rest of the staff are doing a good job”. One surprise for many will be the addition of two riders from abroad. Tim has always been known for developing young riders who have quickly made their mark in the sport. Asked about why two foreign riders, Tim replies “originally I didn’t realise there were going to be so many teams folding and I needed to find riders who could win bike races that weren’t the obvious riders in the UK”. “I was clear early on I needed some foreign riders because having raced a lot in Europe now, I liked the way some of those guys ride and I want that to rub off on some of my guys. That was the logic and at the time, I thought JLT and One Pro were continuing and didn’t have a cheque book to prise riders out of those teams so I felt I needed to go elsewhere”. Finding riders isn’t difficult especially when you have as many as five or six a DAY from July getting in touch with Tim and after a spot on his team. Tim added that it was especially pleasing to get so many requests from riders in places like Holland and Belgium who have seen his team race and like what they saw. “So you’ll see us in the National As and UCI events as well as early season Nat Bs if the promotor wants us because it is racing and we’ll have a split calendar. If there is one race here and one in Europe, then the team will split and do both just to get the legs under us”. One race he doesn’t have to travel far for is the season opener, the Perfs Pedal. Is that one he’d like to do again in 2019? “Assuming Mick wants us, we’ll be there because it is a local race. 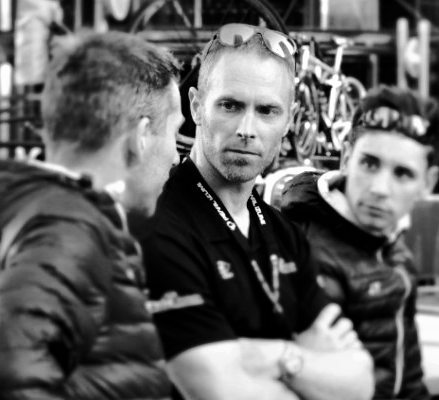 We respect the race and have done it for years, personally as a rider and as a manager”. “It is not an easy race as the team is putting its head on the chopping block but the organiser has always been welcoming and we do it for the right reason; we want to support the local race. I think probably 70 per cent of the riders in the event like us being there to see the pro guys close at hand but then there will always be a few guys who think it should be made easier by us not being there but Nat B’s should be hard and they should be able to cope with it if they want to be Elites”. 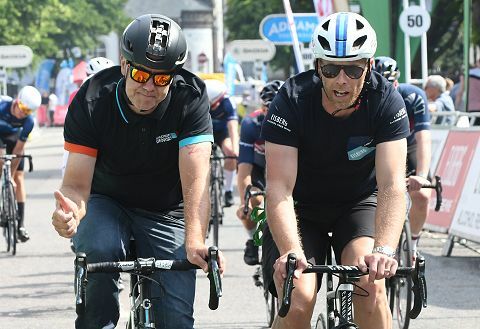 Doing European races though will always be a key part of Tim’s race programme because he firmly believes that doing them helps them be competitive in the likes of the Tour of Yorkshire and Britain which is important for him and the sponsors. At the time we spoke, Tim was already wanting the season to start and the good news was he was able to confirm that sponsors Canyon (UK) and Eisberg were already on board and there could be some new ones to confirm when the team releases the team name and its riders in November. Thanks to Tim for his time and good luck to the team in 2019.